Twelve portraits are given in this collection of figures: the second features a woman and two children, while the rest are individual portraits. The members of the dinner party, many portrayed holding wine glasses or utensils, are displayed with dialogue. This short essay on the image itself follows the print in George Cruikshank’s Table Book. The essay first calls attention to the various meanings of tables—railroad traffic tables, loan tables, public tables at charitable events, and tables within private dwellings. The essay’s claim that “scarcely anything of importance is undertaken without the aid of tables” is confirmed, for the purpose of this gallery, by the use of Fowler’s phrenological chart (and others) for phrenological examinations (Cruikshank 117). The text also draws attention to the disembodiment of the heads; they are described as “‘taken off’ in the accompanying etching” and potentially “cut off from the social board” (Cruikshank 117). The essay ends with an emphasis on reading: “We leave the Heads, however, to speak for themselves” (Cruikshank 118). 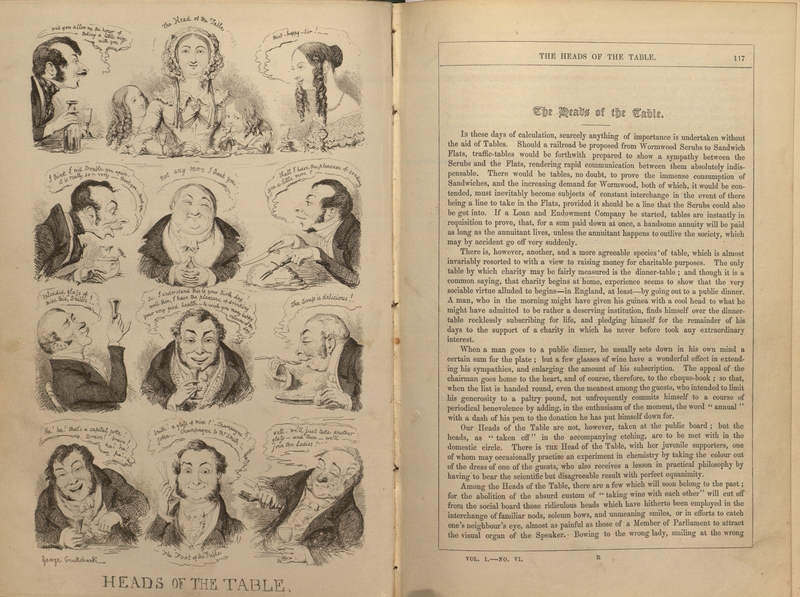 Heads of the Table (1845), printed in George Cruikshank’s Table Book, suggests a change in the artist’s thinking regarding the appropriate way to read the head. Here reading occurs not by means of phrenological maps, but through written dialogue attached to the portrait of each speaker. As a monthly periodical eventually bound into a single book, George Cruikshank’s Table Book both participated in and subverted the early Victorian fashion of sentimental comic almanacs (Patten, vol. 2). Cruikshank’s wood engravings and more detailed steel engravings blurred the line between the “real” and the “imaginary” and stressed the “connection between surveillance and commodification” of London society (Patten 2: 207). Here an emphasis is placed on "reading" heads—not as phrenological maps, but as records of voiced language attached to the portrait of each speaker. At the height of their popularity from 1820 to 1850, periodicals and almanacs provided their audience with an inexpensive collection of visual and literary art that reflected topics of political and social interest. George Cruikshank's Table Book was reported as filling "the decided vacancy" of "a loud laugh" among Britain's monthly periodicals ("Review" 52). Cruikshank, George. George Cruikshank’s Table-Book. Ed. Gilbert Abbot À Beckett. London: Punch, 1845. Print. Patten, Robert. George Cruikshank's Life, Times, and Art: 1792-1835. 2 vols. Rutgers UP, 1992. Print. "Review: George Cruikshank's Table Book." Examiner 25 Jan. 1845: 52. Print. Schlicke, Paul. “À Beckett, Gilbert Abbott (1811–1856).” Oxford Dictionary of National Biography. Ed. H. C. G. Matthew and Brian Harrison. Oxford: OUP, 2004. Web. 2 May 2009.